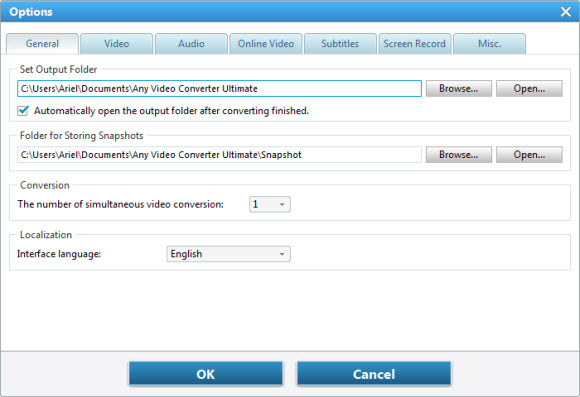 Browse -- Click this button to change the location where the output videos to be saved. Open -- Click this Open button to open the output videos' folder. Automatically open the output folder after converting finished -- Check and the output folder will open automatically for you to locate the output file after conversion. Browse -- Click this button to change the location where the snapshots to be saved. Open -- Click this Open button to open the storing snapshots' folder. Number of simultaneous video conversion -- You can choose the number of simultaneous video conversion. The more you use, the more CPU the program will use to convert the simultaneous video at the same time. Choose your preferred language by scrolling down the menu and click "OK" to confirm. After you set it successfully, the program interface language would be changed to your chosen language right away.